Visitors to the old Paris of poets, students, artists and lovers, you will discover Le Regent Hotel, a very charming place right in the heart of Saint Germain des Pres, in a 18th century residence, not far from the very famous cafe Les Deux Magots owned by the same family. The Hotel is located between the Odeon theatre and the river Seine that is to say only a 3 minutes walk from Notre Dame cathedral and close to the Louvre and Orsay museums. It is an exclusive location to enjoy the spirit of Paris way of life. Your stay will be a blending of shopping, business and entertainment in the famous and lively district of the city. ou will appreciate the comfort of its 25 bedrooms all designed in different styles and colours, one of them overlooking a smart little yard. 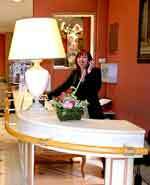 here will always be someone at the reception desk to guide you, to give you suggestions about shows or shops, restaurants or sites to visit and to book your reservations. We can also help you to move around the city and surroundings. We are at your service to send your faxes, and, if necessary, to consult the Net.